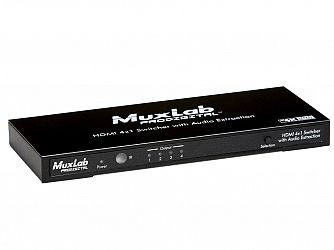 Muxlab 500430 är en HDMI switch med 4 ingångar och 1 utgång som bland annat stödjer [email protected] (3840x2160) samt 12-bit Deep Color och 3D. Switchen styrs med knapparna på fronten eller den medföljande IR fjärrkontrollen. Switchen är även HDCP 1.3 Compliant och utrustad med LED diagnostik.
? 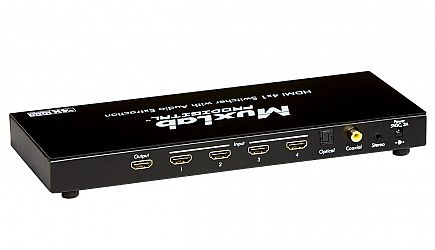 ?The HDMI 4×1 Switcher with Audio Extraction allows four (4) HDMI sources to be distributed to one (1) HDMI display. The switcher supports up to 4K (3840 x 2160), 8-bit color and HD audio. 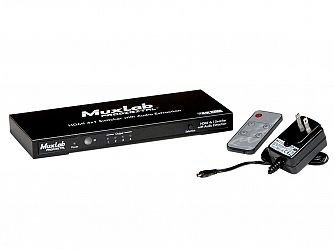 The extracted audio is available on an S/PDIF Toslink, Coaxial and 3.5mm Stereo Jack. The splitter is HDCP 1.3 compliant and features LED diagnostics. Additionally, all HDMI connectors are on the rear panel for neater cabling.